With the resignation of Kirstjen Nielsen from the position of secretary of Homeland Security, the biggest question in Washington is: "Who's next?" 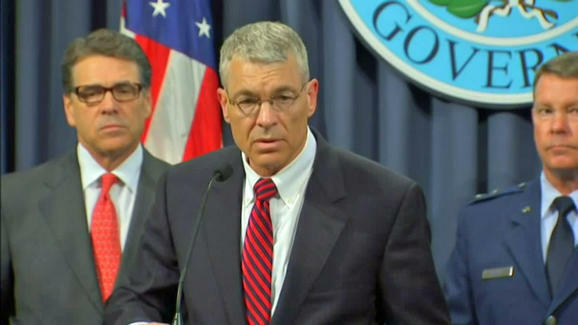 Washington is a town of rumors, and one of the most interesting names that I have heard as a replacement for Nielsen is that of a man whom I have known for several years: Steve McCraw, the director of the Texas Department of Public Safety (DPS). His promotions included Supervisory Special Agent, Unit Chief, Assistant Special Agent in Charge in Tucson, Inspector, Inspector-In-Charge of the South East Bomb Task Force, Deputy Assistant Director, Director of the Foreign Terrorism Tracking Task Force, Special Agent in Charge in San Antonio, Assistant Director of the Office of Intelligence for which he was tasked to establish after the attacks on 9/11. He also served as the Assistant Director of Inspections overseeing the internal inspection process, internal investigations, reengineering, strategic planning and audits. Law-enforcement credentials? His 42-year career has taken him from state trooper in DPS to head of the department, which has 9,678 employees, according to the Texas Tribune. And that department has a wide range of responsibilities, from the Texas Highway Patrol and the Texas Rangers (the storied law-enforcement agency, not the baseball team), to cyber security, intelligence, and counterterrorism, and even issuing benefits (in the form of driver's licenses), as the DPS organizational chart makes clear. In the scope of its duties, it's like a smaller Department of Homeland Security (DHS). And the president understands the power of sound bites: "Make America Great Again." DPS's mission statement? "Protect and Serve Texas." You can picture it on a hat. Further, McCraw has extensive federal experience, as his biography states: More than two decades of his career was served at the federal level, having climbed the ladder at the FBI to the position of assistant director. McCraw's value to the bureau is evidenced by the fact that he was called upon to establish a key office, Intelligence, at a pivotal point in our nation's history, following the September 11 attacks, when the need for actionable intelligence at the federal level was most evident. It was in this role that I first met McCraw. On June 23, 2003, the House Judiciary Committee's Subcommittee on Immigration, Border Security, and Claims held a hearing on Consular ID cards, at which then-Assistant Director McCraw testified. Fraud in identification documents is no longer just a problem of theft. At many entry points to vulnerable facilities, including gates for boarding aircraft, sources of identification are the last opportunity to ensure that people are who they say they are and to check whether they are terrorists. In recent years, Mexican consulates in the United States and other interested parties have sought, with some success, to gain acceptance of the matrícula consular as identification for a variety of purposes. According to the July 2004 white paper provided by the Mexican Embassy, the matrícula consular is accepted as valid identification in 377 cities, 163 counties, and 33 states, as well as 178 financial institutions and 1,180 police departments in the United States. Additionally, 12 states recognize the card as one of the acceptable proofs of identity to obtain a driver's license. It is also accepted by numerous telephone and utility companies, hospitals, and video stores, among other establishments. Given the demonstrated importance of identification documents to the national security, the subcommittee (on which I was oversight counsel at the time) was reviewing concerns about the acceptance of such consular identifications. McCraw succinctly identified the problems with those cards, and the law-enforcement and terrorism threats they posed. His testimony helped to frame key provisions in the REAL ID Act. Opposition to consular identification documents was not necessarily a popular position within the executive branch at the time. McCraw had the courage to make clear, though, that they posed a danger. And because of that courage (not always a common commodity in Washington), changes got made that in turn made the country safer. As noted, McCraw thereafter returned to Texas to protect the country's second-largest state against homeland security threats, and eventually head DPS. McCraw's performance in the DPS demonstrates that he knows the border, and the issues that DHS is dealing with today on that border. Texas is home to more than half of the United States' border with Mexico. Along this 1,200 mile span, human and drug smuggling operations and related criminal activity are a significant concern. To combat these issues, the Texas Department of Public Safety launched Operation Strong Safety (OSS), a multi-agency effort that temporarily increases the patrol presence in areas with the greatest need. Under the OSS program, air, ground and marine saturation patrols from more than 15 agencies coordinate efforts to disrupt transnational criminal activity in areas outside official ports of entry. In concert with these efforts, intelligence analysts using the Homeland Security Information Network (HSIN) are able to take real-time feedback from field patrols, provide strategic analysis and share that information simultaneously with officials from every agency involved in an operation. HSIN also provides mapping functionalities and the capability to stream video from air surveillance platforms, providing commanders with information and live video from officers on the front lines. The OSS illustrates capacity-building on a nation-wide scale. Efficient and timely data exchange coupled with a "shared first" culture, ensures proactive, informed decision-making. The establishment of shared services and interoperability optimizes mission effectiveness and maximizes available resources — ultimately conserving taxpayer dollars. OSS produced solid results, a fact that is clear from a March 10, 2015, DPS news release on the operation. That operation was launched in June 2014. During the first week of OSS, there were 6,606 apprehensions of illegal aliens in the Rio Grande Valley of Texas. "By week 11, the numbers had decreased below 2,000 and have consistently remained low through week 28." In addition, by the time of the release: "OSS-related drug seizures ... totaled more than 180 tons of illegal drugs that had been smuggled across the border and were destined to be distributed throughout the state and nation." I have first-hand knowledge of OSS, as I stated in my August 22, 2017, post, "View of the Border from the Rio Grande Valley and Del Rio". I rode on Texas Highway Patrol boats with state troopers along the Rio Grande River, where they kept watch for drug and alien smugglers. Their service was a critical supplement to the efforts of the Border Patrol. Again, under McCraw, Texas DPS created an operation combining the resources of multiple agencies to help secure the border with demonstrated success. Kevin McAleenan, the acting secretary of Homeland Security, is likely the front-runner for the secretary position on a full-time basis. He will have to control the humanitarian and national-security disaster occurring along the Southwest border, and do it quickly, as the number of aliens seeking illegal entry is likely to increase for at least the next two months, if not longer. Why quickly? President Trump has shown a lack of patience as it relates to the border and immigration enforcement generally, hence the firings of former Homeland Security Secretary Kirstjen Nielsen and U.S. Immigration and Customs Enforcement (ICE) Director Ron Vitiello. CBS News cites an unnamed source who suggested that "the White House believes Kevin McAleenan will be more effective in implementing White House policy." They may be correct, but many of the issues that are causing that border disaster require action by Congress and the courts. There may not be much that McAleenan can do as secretary, at least in the short run, to stanch the flow of aliens entering illegally along the border. Should the president decide to go with new leadership yet again, and if the rumors are correct, Steve McCraw would be an excellent choice to coordinate the efforts of the more than 240,000 employees at DHS. Plus, he could likely leverage his FBI experience to bring the power of the Department of Justice to bear on that effort. Alternatively, McCraw would be a strong candidate for the proposed position of border czar. The New York Post reports that this individual "would coordinate how federal law enforcement and immigration authorities implement" the president's so-called "hardline policies". Again, McCraw has headed a sprawling law-enforcement department and instituted an effective state-level operation to respond to criminal threats along more than half of the 1,954 mile border with Mexico. As border czar, he would simply have more resources at his disposal to control all of it. The president could do worse than calling McCraw back to Washington to carry out his border policies. If the rumors are true, he may.